Promotional lanyards have so many uses and are an ideal way to promote an organisation and its brand. 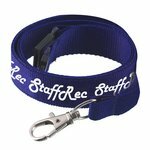 Lanyards can be supplied for use by companies where all staff and visitors where the lanyard printed with the hosting company’s name and logo. Promotional lanyards branded with your logo, can also be used at special events including tradeshows, seminars, exhibitions and conferences. The main purpose of a lanyard, apart from promoting a brand is to attach to a clear pocket in which an individuals badge is held. 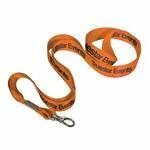 The lanyards we supply can include safety release features, clear pockets and even made from recycled materials. Sample lanyards are available upon request and we can even supply some on an express delivery service for clients in a rush. Promotional lanyards can be customized attractively to complement the branding of your business or any event you wish to organize. 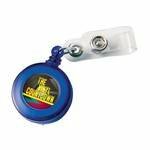 This accessory can be used effectively in various occasions such as festivals, conferences, events and much more. The prime use of lanyards is found in carrying security or identification badge. 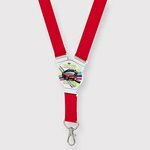 Instead of searching your pockets to get the badge in the hour of need, you may place the badge on a lanyard which rests conveniently around your neck or affixes to your pocket. This way you will be able to access the badge easily and quickly. Whenever you are asked to show your badge, you will not have to mess your pockets to find the required identification or security badge. Wearing the lanyard around the neck or attaching it to the pocket is a simple way to display your badge throughout the day at workplace, meeting or event. With your business clearly visible, it is a great way to get your name in various events where other companies and potential clients are going to see it. Lanyards are also a great way to keep your both hands free by storing your cell phone, keys and sunglasses in lanyards. Holding USB drives securely is so also very easy with these stylish plastic devices. Tubular lanyards are a good choice for keeping cell phones and sunglasses as a great summer marketing campaign and giveaway. While using this plastic device for everyday needs, you will realize its importance and the potential brand exposure. The best idea is to count on its usefulness in promoting your business and spreading brand awareness. If you would like to see a printed lanyard from a previous marketing campaign, we can send samples out to you. We can also supply you with a virtual visual showing how your logo could look on any of these products. The visual is generated by our in-house design studio and we often find that this service helps clients to see their logo and colour choices in detail without the need for a pre-production sample. If you don’t have printer ready artwork our design team can convert what you have using our design software. When use web-based quotations systems so you can view, download and accept our quotation when you are ready to place an order. We also accept orders online using our website checkout process. When we process your order we check the details and the artwork file and provide you with an artwork sign-off form. We can make amendments at this stage of the ordering process. This is why we quote all delivery times from acceptance of the artwork sign-off form. How many colours can you imprint on a lanyard? This depends on the type of lanyard. The most common print is a single colour imprint on a contrasting background. Most often white text on a coloured background to match one of the corporate logo colours. 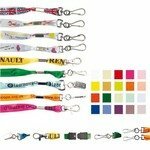 Multi-coloured prints require a white background to really work and white lanyards tend to show up dirt over time. 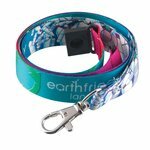 Do you supply environmentally friendly lanyards? We can supply lanyards made from eco-friendly materials. The eco materials will include either sustainable farmed and organic fabrics or recycled and reclaimed materials. Do you supply safety release mechanisms for lanyards? Yes, we can for some of the lanyards we supply. The lanyards have a safety release clip built-into them which releases when placed under pressure.